In this episode, Pam and Lynn chat about our binding preferences, and go-to quilt patterns. Note: At 35:19 Pam lets slip a short curse word. Apologies! 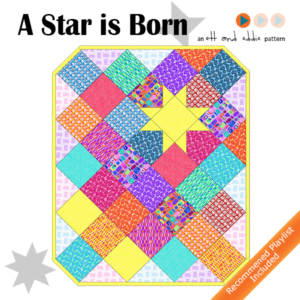 T he quilt hanging behind us is our pattern A Star is Born, perfect for layer cakes or 10″ square precut assortments! Get a copy of the digital pattern at our shop, and enter to win a copy of the pattern AND fabric to make the top from Christa Watson’s newest line Abstract Garden! Our next Book Club is Friday November 30 at 7pm US Eastern! I’d like to see a chat about quilts using alternative fabrics such as corduroy, denim or ticking along with the usual quilt cottons. I really enjoy listening to you. I learn and laugh at the same time. Would love to hear about your experience at Quilt market! Yes, tell us about everything at market and festival! Thanks for another great episode of The Stitch. I would like to hear more about your design process! I love your shows! It’s always a pleasure when a new one airs. I’d like to see a chat about using alternative fabrics in a quilt such as ticking, corduroy, leather, and denim along with the usual quilt cottons. I’d like to see a chat about using alternative fabrics such as corduroy, leather, and ticking alongside the usual quilt cottons in a quilt. Organizing and tracking your WIPS and ongoing quilting projects. Seconding the vote for the Quilt Market experience chat! I would also be interested in hearing more about how you both manage to make time for quilting. While that’s certainly more of a personal kind of thing, as to how much time you all have, I would be interested in knowing just how frequently you are both at your sewing machine, or various quilting-adjacent activities (planning and/or designing projects, etc) and just, really, how you both manage to get so much done. Have you ever bought any of the quilting subscription boxes like Quilty or Sew Sampler from Fat Quarter Shop? Would love to hear about homemade gifts that y’all are making this year and all about quilt market. Have you ever gotten a quilt related subscription box? Love the video. You won’t believe the Christmas gifts I’ve received! I thoroughly enjoyed this episode, you two crack me up! I would like to hear more about Pam’s experience with her Sweet Sixteen and maybe see her do some quilting videos. Love the show. I would love to see more bloopers. I would like to see more shop your stash videos. Whatever you ladies talk about is ok with me, it’s your show. Would love to hear about market and why you started quilting. I can quite happily sit and watch someone sew – I don’t even need them to do anything else to entertain me! I love to watch your videos and have learned so much from you two. I love Christa Watson and her fabrics. Thank you for the chance to win an awesome give away! I love watching you both and look forward to your new shows each month. Have you ever purchased any of the quilt related subscription boxes? Can’t wait to hear about Quilt Market! 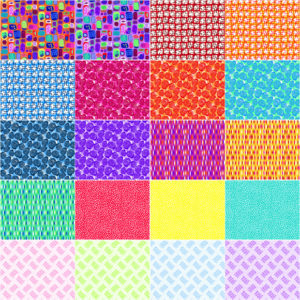 Fat Quarter Shop has a new layer cake pattern that would make a good go to quilt. I’m excited to try it for my nephew’s big boy quilt. It’s called Layer Cake Custard, I think. I like this quilt pattern. It should be fast and easy. Maybe an episode of quick gift ideas? Or tips about sewing with your children? Love your show! What is your method for getting a quilt ready to be quilted? What was new at quilt market this year? Such pretty and bright colors! How about an episode on how to use EQ7! I would love to have you guys do an episode on designing fabrics. What programs work the best And how to submit your designs. I really enjoy listening to the two of you. I’m anxious to here more about the Block of the Month you’re working on. Laser cut Appliqué pieces! Woohoo! Christa’s fabric is very pretty. Would like to hear you chat about quilting suitable for modern quilts. This pattern is great! I’d love to hear you talk about ways to connect with quilt people in the Atlanta area. Love to hear about Quilt Market. I enjoy the Stitch. I would like to hear how you organize your time to get so much accomplished! I would like to hear about your favorite rulers for machine quilting. I loved the “how would you quilt it” episodes. I frequently stall at the quilting process because I have to figure out a plan. It’s that time of year…what are your favorite quick quilty gifts? In a future episode I’d like to hear you chat about what to keep in mind if entering a quilt in a show. General criteria fir binding, label, prep to hang, etc. Each show is different, of course but there must be some commonality to keep in mind. Another topic- how to find/choose a guild. Would be great to get some quilting math lessons! One thing that intimidated me is figuring out how much fabric to buy. Not only in purchasing backing but creating blocks. I would like to see a show on how quilting fabric is made. Is it true that you shouldn’t use 108″ fabrics for piecing? Is it different quality than quilting fabric? Is there a difference in quality between quilting cotton at 45″ wide and 108″ wide quilting cotton? I would like to know the differences in quilting cotton quality. I was told not to use my 108″ leftover scraps to piece with. Would love an honest discussion on same. Thanks so much!!! I would like to hear about your adventures at Quilt Market and Quilt Festival. And I’m interested in quilty vacations like cruises and tours … have either of you ever done anything like that? I love your favorite books series and how you quilt it series. I would like to hear about the ways you store fabric and all the things we need as quilters.